Robert "Bob" Buchser is a tireless contributing member of the Santa Clara community! Bob has enriched the community for more than 70 years in the areas of education and for our youth as a Teacher, School Administrator, Boy Scout Leader, Explorer Scout advisor, Youth (PAL) Soccer Coach, School Volunteer, Triton Museum of Art member, local Red Cross President, and as a member, President and a Chair of the Santa Clara Rotary Club. Bob grew up accompanying his father to work, a teacher and Principal in Santa Clara. Many of his aunts and uncles also served as teachers, administrators and community college board trustees. Bob received a bachelor's degree in math and teaching credential from San Jose State University. 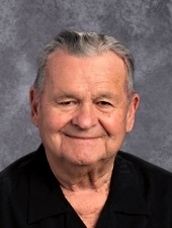 In 1958, he joined the Buchser family tradition becoming a math teacher and bus driver for Santa Clara High School with a long and rewarding career at the Santa Clara Unified School District. Bob's ability to teach was coupled with his ability to see the potential in all students and to encourage them to be "their best!" As Dean of Students and then Assistant Principal at Peterson High School, he was responsible for student activities, counseling, and attendance. As Vice Principal at Wilcox High School, he supported students & families with issues of truancy, discipline, and parent education. Bob had an affinity for working with at risk youth and was named Principal of Valley High School in 1987. Bob embraced his new role, finding daily opportunities to inspire and encourage youth who many had given up on. His tireless efforts helped students realize their potential and they always knew Mr. Buchser wanted what was best for them. In 1991, the District called upon Bob to help the ever changing area of adult education at New Valley High, a school designed to offer career and technology education. Bob welcomed the challenge as Principal and worked the remainder of his professional career at New Valley. He was named the County School administrator of the year for adult education in 1994. While on family vacation in 1995, Bob was the victim of a random shooting in the Tahoe area by four at risk youth who had stolen a gun. With life-threatening injuries, he asked his daughter to call the Superintendent that night to advise he would be "out of work for a week." His commitment to his students and the district were unmatched! Bob's recovery was incredibly difficult over the following months but he was determined to return to work and he did! Bob was named the ACSA Administrator of the Year for SCUSD and in 1996 he retired but that didn't slow him down. Bob has continued to give back to Santa Clara in countless ways, including as a member of the Santa Clara Rotary Club for nearly 50 years. At the Santa Clara Rotary, Bob has served as the Chair of the Rotary Club Regional Speech Contest, coaching participating high school students and recruiting advisers and judges. He set up a memorial fund in his wife's honor for a graduating student from Presentation High School where his wife had taught for 28 years. Bob volunteers in many ways to improve the lives of current SCUSD students. He is an active volunteer at Peterson Middle School joining his daughter, Principal Sue (Buchser) Harris. As Santa Claus, Bob has brought joy for 20 years to many SCUSD elementary students and for the Rotary Club. At heart he is an educator and has dedicated his life to teaching youth, particularly those who are at risk, and continues to give back to the community making Bob Buchser deserving of the 2018 Austen Warburton Community Service Award. The Austen Warburton Community Service Award is presented each year to an individual or organization exemplifying the spirit and character of Mission City Community Fund founder Austen Warburton. An attorney, civic leader, educator, historian, and philanthropist, Warburton's many community contributions are the cornerstone for making our already outstanding community an even better place to live. Significant achievement in fundraising for an organization that is dedicated to enriching our quality of life in one of the "Five Focus Areas"
The award is presented to each year's recipient during the Annual Charity Auction and Dinner Dance held in November. If you know someone deserving of the award, download the Nomination Form. Father Paul Locatelli, S. J. Bob Buchser is the 2018 Recipient of the Austen Warburton Community Service Award! Click here for details. China Stix, Santa Clara is the 2018 Recipient of the George & Donna Burdick Business Award! Click here for details.